Alaska senator again proposes renaming Mount McKinley to Denali; name widely used in AlaskaAlaska’s senior senator has once again introduced legislation to rename Mount McKinley, Denali. Ohio is the birthplace of President William McKinley, and for years, members of that state’s congressional delegation have filed measures or included language in bills to retain the name Mount McKinley. One such bill was introduced last week by Rep. Tim Ryan, D-Ohio, who said in a release Tuesday that the name must be retained “in order to honor the legacy of this great American President and patriot.”Comment: Ryan's reason for keeping the name "McKinley" is ridiculous. President McKinley probably has thousands of towns, buildings, schools, and so forth named for him. He doesn't need one more "honor." Also, few people know anything about Mt. McKinley. Of those few, even fewer associate it with President McKinley. All told, we're talking about something like 1% of 1%. In other words, only 1 in 10,000 people thinks, "It's so wonderful that they named Mt. McKinley after William McKinley, our 25th president, who 'led the nation to victory in the Spanish–American War, raised protective tariffs to promote American industry, and maintained the nation on the gold standard in a rejection of inflationary proposals'" (source: Wikipedia). To everyone else, the name is just some anonymous old name. As usual, debates over geographic name changes show America's white privilege in action. Why should the thousandth use of the name "McKinley" trump the first and only use of the name "Denali"? Why don't the local people with historical ties to the mountain have the primary say? Because white people feel they deserve to get everything they want, no matter how unreasonable it is. For more on the subject, see Renaming Mt. Rainier and Restoring Traditional Indian Names. What's funny is, nobody in Alaska refers to it as Mt. McKinley. It's locally called Denali. Basically it was an attempt at what's known as a "forced meme". One guy couldn't convince Alaskans of the value of some of McKinley's policies, so he named the mountain after the future president just to spite them. 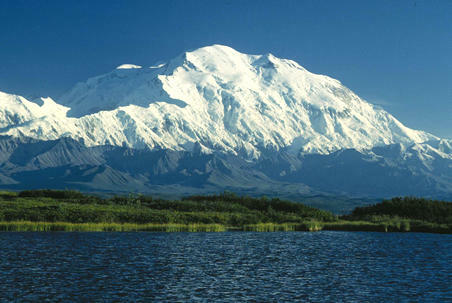 The congressional name game in regards to the changing of the name of Mount McKinley to the Athabaskan name Denali continues in Congress with Senator Lisa Murkowski commending her colleagues in the Senate Energy and Natural Resources Committee for helping advance legislation for the name change. The Energy committee approved the measure to change Alaska's mountain to its locally known name of Denali on Tuesday by a voice vote clearing it for consideration by the full Senate. Indians are "whiners," not warriors? "War paint for today's business world"
Morris Mirror: Natives = "terrorists"
"Redskins" approaching a tipping point? Idle No More's "Day of Action"
Pine Ridge = "food desert"
50 Eskimo words for "snow"
Supervisor: Idle No More is "pointless"
Twin Cities: Dakota War = "genocide"